Forget Christmas in July. For the stock market, it's looking like the holidays came in August. The Dow is on track for its best month since February. It's already up over 1.5% in August. And it's not just "blue chip" American stocks in the Dow that are doing well. The Nasdaq, which is loaded with tech and biotech companies, hit a 14-year high Monday, and the S&P 500 is up even more than the Dow. Few would have guessed this performance surge was coming. August got off to a rough start. Some were even warning that a correction -- when the market drops 10% -- might be near. Related: Can the stock market rally keep going? But U.S. stocks have chugged along, despite the ongoing conflicts in Ukraine, Gaza and Iraq. Consider that CNNMoney's Fear & Greed Index still says "extreme fear," but the reading today is 25 compared to a mere 7 a week ago. There's still trepidation, but not as much. 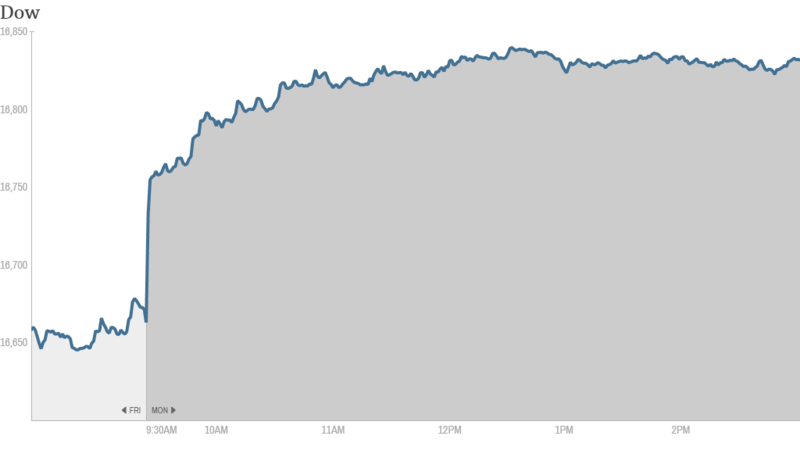 On Monday alone, the Dow is up 175 points -- one of the larger single-day moves this year. 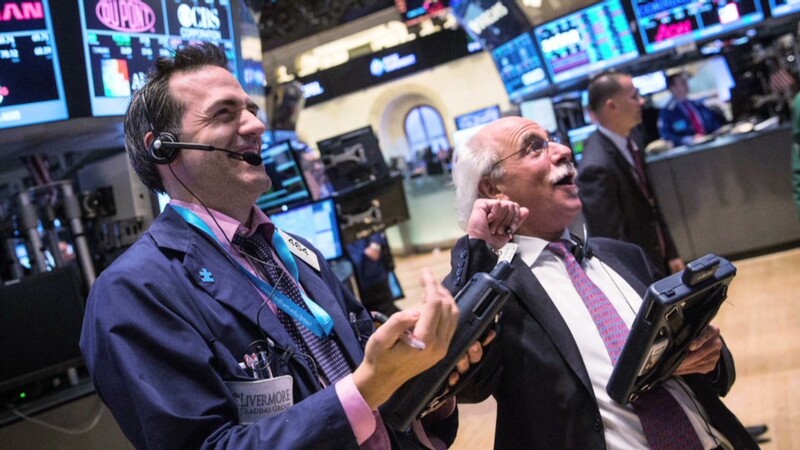 The Dow is up 1% on August 18, 2014. By and large, corporate profits and earnings have come in better than expected in a wide variety of sectors. Most companies have now given their second-quarter reports, and the vast majority are showing true growth in sales and revenues. In other words, the stock market overall isn't cheap, but the current pricing of many stocks is still backed up by strong corporate performance. That's also playing into increased merger and acquisition activity as companies put their cash on hand to work. The latest is a bidding war between two companies that want to buy Family Dollar. 2. U.S. economy is getting better. The economy isn't where anyone would want it to be, but it's definitely in a stronger place than a year ago. More people are getting jobs, and the country has bounced back from the polar vortex that acted as a sort of winter chill on the economy. Perhaps most importantly, the Federal Reserve has indicated it will continue to keep interest rates low until next summer, at the earliest. That's been a major stimulus that encourages businesses and individuals to invest and spend again. 3. Geopolitics hasn't caused big enough ripples. The flare ups around the world -- from downed planes to invasions to Ebola -- have had impacts on companies and the stock market, but they have been short-lived in the U.S.
Russia has been the biggest shock, since it is so interconnected with Europe. On Friday, news of increased tension in Ukraine sent the Dow down about 50 points after a strong week. But investors have kept a close eye on commodity prices, especially oil and natural gas, as a gauge for the impact of global conflicts. The reality is that oil -- in the futures market and at the pump -- costs less this August than it did in August 2013. U.S. domestic oil and natural gas production has insulated America from problems in Iraq and Russia. The result is a stock market that hasn't been as stellar as 2013, but is certainly at levels that should make investors reasonably happy. The S&P 500 is up over 6.5% for the year. The tech-heavy Nasdaq, which had a large sell-off in the spring, is now up almost 8%. Even the Dow is up 1.5% after being in the red a mere days ago.